1 Man No.1, 2 & 3 do not have harmonious centers. They often appear quiet as if nothing is wrong with their centers but this is artificial. Man No.4, 5, 6 & 7 have great mastery over their centers and all inner forces. I may call a “silent”, good and “perfect” man No.1, 2 & 3 essence-positive individuals, while the disharmonious ones, personality-positive individuals. 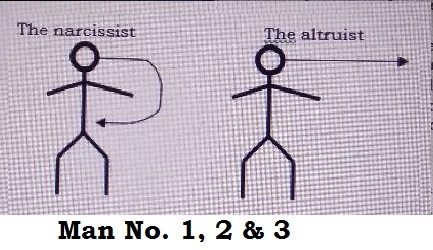 Man No.1, 2 and 3 cannot attain a right function in their centers without school help because they are in one of the gravity-centers each time and could not integrate them correctly. For the thinking man the divine predominates and will continue to dominate even in the automatic moving function. The feeling man will try to feel a mathematical problem and develops aesthetic and artistic mathematics. You are born man No.1, or 2 or 3 but you are never born man No.4. However, you can be man No.4 and above. 2 For the ordinary man (man No.1, 2 or 3) everything flows and disappears in their first world ‑ both the astral music and the divine language – and will be gone forever. Nothing would be purely his; most would be imitation. Here even a Ph.D. holder may not produce anything purely his. The path of his first world will be in another stream. The most beautiful industry is never the function of one man and the ownership of the producer. If anything is produced, it is always under the ownership of a “robber” who has never even done anything or the true authors of the industry are concealed and sent to “prison” and the pseudo-authors become the marketing authors. Building a factory is like writing a book. A factory is “written” by many “authors” and a book “build” normally by one or two hardworking “workers”. You write a book but others rename the content and even chase you away. Such is the fact of plagiarism. When a great task is accomplished, the names of the producers and the planners should also be recorded on a special slap to recognize their deed. The achievement should be given due recognition, and not just the task leader alone who gets the sole recognition for the “dollars” given. Recognition seekers, title seekers and rank seekers ‑ all of them have intentions and practices which are conscienceless. An inner world of this type with the “planners” around the “devil” and which flows semi-consciously in this manner for a prolonged period will surely have to suffer. 3 An ordinary man cannot even exhibit at will a real controlled of any inner forces of his body. Man number 1, 2 and 3 is by nature dualistic in their approach to reality. 1 Man number 4 is not a dualist. He is a transition man and has a stable direction due to a strong magnetic center. 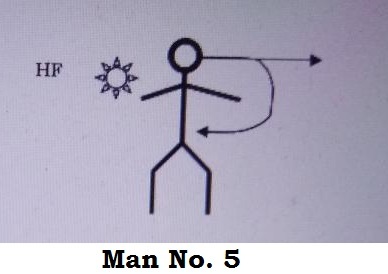 Man number 5 has a being with self-consciousness, almost perpetual even though the body undergoes inner and outer transformation. The higher feeling center (HF) is active. 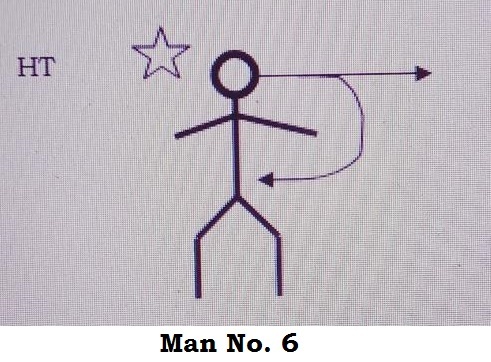 Man number 6 has a being with objective consciousness. The two lines of focus never seem to disappear even after much bodily transformation. The higher thinking center (HT) is active. 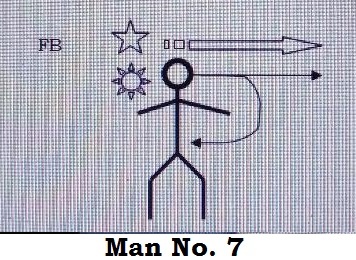 Man number 7 is a crystallized man number 6, stable and with a developed Fourth Body (FB) and with a Real ‘I’ indestructible within Our Solar System, even though the physical body has disappeared a long time ago. 2 On man No.4, Prophets, Great Individuals and Geniuses: In fact, all existing “schools” with visible coatings and good names are actor schools. By themselves they cannot offer much to humanity, for they have none ‑ they are internally empty but wearing the cloak of Great Individuals. And the worst thing is: Those pseudo-great individuals are often projected as great individuals to be worshipped upon. True esoteric individuals are few. They come and perish and when they perish the esoteric school often loses its helmsman. It becomes a “school” operating at a lower level, and when the second helmsman perishes, the level may become still lower and so on and so forth. Like others, it has experienced this sham phenomenon because there are no more prophets in them (not supposed to have any recognized). Wrong people have taken the helmspersonship and sought coverage for ulterior motives. Ordinary ‘I’s cannot really form an esoteric school. Highly conscious men can but there are few highly conscious men in the world. It is difficult to be continuously Jesus ‑ Jesus every minute and every second, from birth to death. But the followers will probably spend one or two hours a day for their school. Gradually and owing to the usual chronic mechanical habit, transforms the school into a school of “parrots”, all the members now wearing the mask of the school. If your school is made up of such people, it is best to bail yourself out before you got eaten to the bones. The main aim for a school is to create real Buddhas and ensure it remains a real school. So long as members choose to avoid working on themselves, on others and to remove the negatives (evils) both in themselves and in others, there is no meaning gathering here. Every gathering is ‘I’-ied. And it depends on the type of ‘I’ gathered around you. In every gathering, there are always some relevant ‘I’s, some irrelevant ‘I’ and some partially relevant ‘I’s, and to distinguish them is essential. Labor is always consumed in an ‘I’ gathering. It can flow from the empty into the empty or it can bear fruits. Lower ‘I’s is bound to roam abundantly as an essential substratum of the world of human psyche forming at the periphery of planet earth. It is impossible to be removed ‑ the ‘Confusion of the Tongue’ cannot vanish into thin air; nor is the ‘exo-meso circle’. The esoteric circle often disappears when man no.4 disappears from the school. It is only in historical upheavals that it appears and when an esoteric circle becomes bigger, more people are subjugated to its influence. When an esoteric circle becomes smaller, the integration and identity of the group disappears. The carriages are quite beautiful there on earth’s surface, but the man in them will not care a hair on their function. 3 Newton, Galileo, writers of the Holy Bible and the Koran (I said ‘writers’ because it is an objective common sense fact that cannot be denied by all sane man. ), prophets of communism, Gurdjieffism and Buddhism — all these are produced by people with essences. And essence repeats in different forms at different time and with different people. Essences inevitably overlap with one another. Essences really begin with man No.4. To be man No.4 is to be a Infant Jesus …… man No.4 is a historic man. 4 All great men ‑ thinkers, inventors, artists, etc., indicate the levels of the being of the fourth body. The thoughts of Mao Zedong, writers of the fourth way, the Gospel, the Koran, the Buddhist scriptures, all works by great men, etc. are all higher thoughts or works. 1 We do not see with our eyes but with our inner brain dimensions and brain dimensions are material insofar as they are cosmic hydrogen. Man could see otherwise with the slightest change in the composition of these cosmic hydrogens. He sees something else while looking at the same thing for some time. It is possible therefore to make man see that which is not, and not see that which is. 2 Strive to see that which is already there; strive to study its motion and possibility of evolution and its to-be; strive then to hasten or change the existing state. Always strive to see more than just the mere cover. 3 The different inner angle of seeing the same thing by different people leads to different outcomes. 4 If your eyes are sharp, you shall see. If you shall see, you shall not see as soon as you are not. When certain conscious hydrogen concentrate enters your body, you begin to see. But you are neither able to direct and control them nor attract the hydrogen you need. Because of the weak psychic attraction, you would soon lose them, and they would link up with your other contradictory psyche hydrogen. As a result, you could not trace the path. The conscious force comes again, inserts some more of other psyche hydrogen. The psyche concentrate again enters your body. You get a shock and you begin to see further. You are put on the right path again. Again, this time because you are lazy, you have not exerted yourself. The hydrogen concentrate degrades further and soon loses all its conscious characteristics. 5 Impression falling on the body of an ordinary man is ‘do’ and it would refine to ‘re’ and even ‘mi’ but for a higher type of man, man no.4 and above, it goes beyond all these. He becomes ‘fa’, ‘so’, ‘la’ and ‘ti’. A mystic always sees beyond ‘mi’. 6 Move about quietly. Keep everything inside you, very silently and watch. Slowly you will begin to see the real world. Only those who see the real world shall not fall prey to the suggestion of others. 7 I will tell you the meaning of being invisible. Now, you visit some friends. You enter their house. Your body generates an atmosphere and others too. They watch you “consciously” and you watch them “consciously”. After some time of “seeing” the seeing disappears. There is no more “seeing”, and you become invisible to them and they become invisible to you. Anything you do, no one bothers. Their behaviors harmonize with your behavior. This is being invisible. 8 You can only “see” school when your level of being, not really knowledge is near the level of being in the school. If your level is higher, you must start out from her angle and flow with her inner octave. Only at the right point can you tap on her inner octave flow, so that its direction can be changed. 9 Ah! Just these human seeds like myself, which they called man. I saw herds of planetary bipeds on the planet Earth. And loss in their social instinct they could not escape into the dimensions of the three Sees ‑ Conscious See, their Anklad See (seeing through the highest grade of objective reasoning) and Holy See (seeing through the highest grade of objective feeling). 10 To make a person see exactly the way you see, exactly from the angle you intended is the way to your invisibility. If she stands non-antagonistically external to you, then she is not in your stand at the moment. If she opposes you, the angle and octave thereof would be opposite and antagonistic. She will be antagonistically external to you. If she can see exactly the way you see and you can see exactly the way she sees, then both of you will be “one”.